Twitter is, in many ways, the backchannel of social media. Journalists, designers, celebrities and politicians use it to connect one on one and en mass. But thousands of businesses call the micro-blogging platform home as well. Using it to engage their community, entertain fans, and convert followers into word of mouth customers. We thought it was about time we took a closer look at what brands are using Twitter the best. This is a tough nut to crack, so we pulled in some hired guns to help us make the call. But as I said, we need your help to get started. Post before December 1st at 5pm EST. 1. Engagement – Do they get a response? 2. Entertainment – Are they creative? Do they share interesting things? 3. Conversion – Do they work in business goals well? 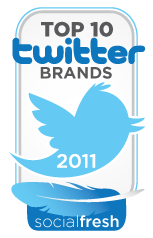 Four judges will be the final decision makers and decide our Top 10 Twitter Brands of 2011. Definition: A “Brand Twitter Account” is defined as any Twitter account representing a company, not an individual. That company has to be recognized as clearly selling a product or service. Conflicts: Twitter accounts that have been worked on by any of the judges (or their companies) can be nominated — but those judges cannot comment or vote on those specific Twitter accounts. We have teamed up with four industry thought leaders on Twitter and business.